Diane is a HGTV girl; she likes the design shows. Each year for the last few HGTV has had a give-away of a pretty special house somewhere, and this year, as fate would have it, it isn’t far from paradise where we have been since Saturday night. After we’d had as much of Duval Street as we could take, we decided to do something different today, and headed up US 1 to Islamorada where this year’s Dream Home has been built. Don’t worry: that’s about all I’m going to say about it, except that I enjoyed touring the house, and if we won it, I’d at least think seriously about living in it. More to the point of this series of columns is the rest of what we did today. We left the apartment about 10 and headed north. It’s about 81 miles to Islamorada from Key West, and the trip was not at all unpleasant. We got to see the sights we couldn’t see on the way down on Saturday due to darkness. And since you can’t go very fast on the mostly two-lane road, it was noon when we got close to our destination. 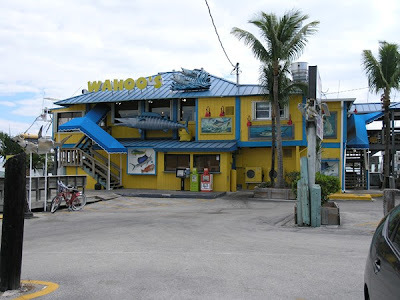 A friend had recommended a place for lunch, which we couldn’t find, so we stopped at a place called Wahoo’s, which is on the water, and had lunch before tackling the tour of the Dream Home. I had seafood (yea!) in the form of a basket consisting of scallops, shrimp and fries, and Di had a basket with just shrimp (she loves seafood, as long as it’s fried shrimp). Not far up the road we came to the Dream Home location and went through the place. It is well appointed and located in a very nice place. Trouble is that there are seven more places planned to go in a relatively small area, making the place less desirable from my point of view. The ticket money goes to a charity, so even though admission was overpriced, it probably was worth it. We walked around the art shops nearby and then headed back, stopping at the Boondocks bar and grill to break up the trip. Dinner was at Kelly’s, a couple blocks off Duval Street, a place that once was the beginnings of the now-defunct Pan American Airways, and turned into a restaurant by Kelly McGillis of “Top Gun” fame. She no longer owns the place, but it still bears her name. Kelly’s is the hands-down winner for atmosphere so far, with an outdoor dining area with palms and other natural scenery. The only negative was that a room over top of the kitchen was a rehearsal hall for a show on the weekend that was, unfortunately, open so that we could hear the goings on up there. The menu was a good one and the wine list passable. We opened with a Macadamia Nut Encrusted Baked Brie appetizer with mango salsa and pita bread “points” that was pretty good. Diane had a Five-spice Encrusted Filet with a Ginger Shitake Cream Sauce (that was under done and had to be sent back, but very good), and I opted for Camerones Rellenos, which is butterflied shrimp stuffed with crab meat, wrapped in bacon and baked with an orange beurre blanc sauce. It wasn’t all I had hoped for. We headed back to the apartment so that Diane could finish watching tonight’s edition of "American Idol" while I had a cigar on the deck and finished my McCain rant (See below).